EVERYTHING IS STILL AWFUL, BUT WE’RE GOING TO GET THROUGH THIS TOGETHER. DO YOU HEAR ME??! TOGETHER! Hey, it’s issue 2 of the Stuff report! The Stuff report examines changes in the Blue Jays pitching staff to look at changes in performance, risk of injury, or for the deeper meaning of life and a cold rationalization as to why we put ourselves through the agony of donating three hours of our time to something that will only bring us suffering. The reason for that last one, is Stuff. Stuff brings us all together. There are two new, unfortunate debuts on the Stuff report this week with Cat Latos’ dad and Casey Lawrence joining in while getting pummeled on the field (Lawrence more than Latos). Both of the new guys profile with less than stellar STUFF – so it’ll be interesting to see whether they go down the Estrada route and dominate with awesome secondary STUFF or turn into cannon fodder. The pitcher who gets the most amount of excitement is none other than yesterday’s birthday boy himself, Marcus Stroman. Fresh off a time frame that saw two complete games and a 10 K performance, Stroman is becoming the ace of the staff people expected last year. What has changed between this year and last year in his Stuff? 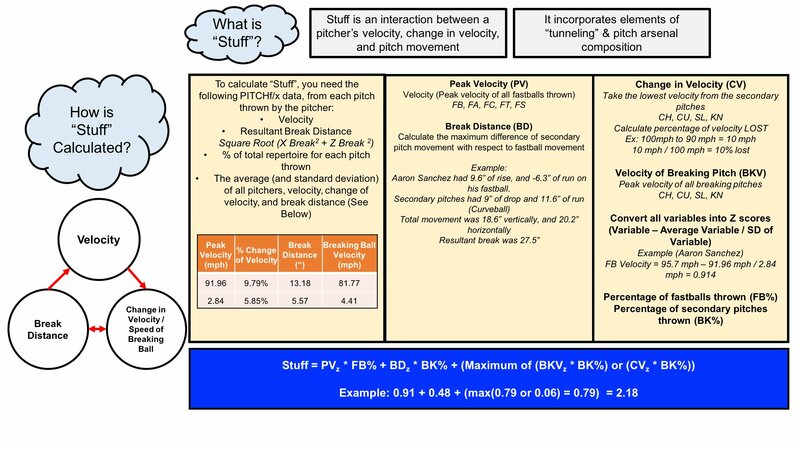 First, be warned because there were some changes in velocity readings that lead to pitchers having inflated numbers this season – that’s been addressed in the STUFF score, but not necessarily in just looking at the average velocity values. 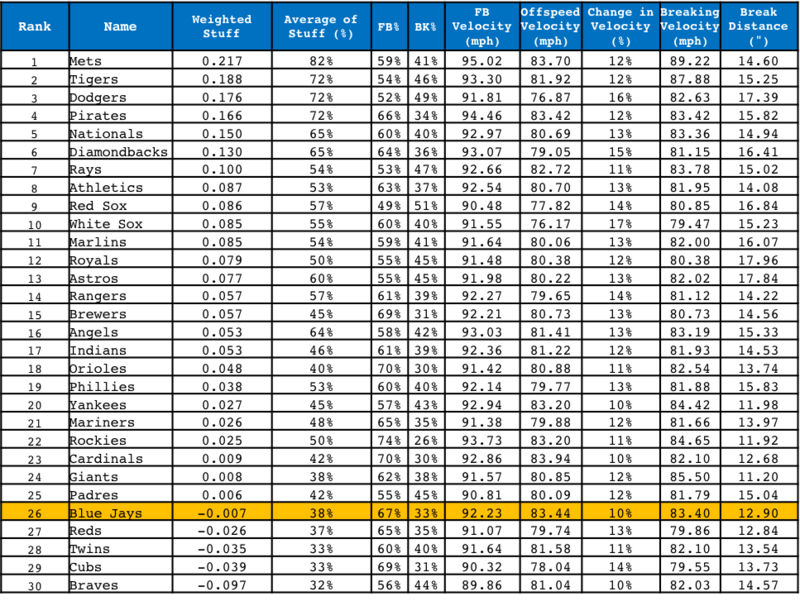 Stro looks to be throwing harder this year, but looking at his average fastball velocity – it isn’t up by a lot – is not enough to buoy a massive change in results. When it comes to the components of his Stuff, the big change is in the separation between his pitches; he is getting nearly five extra inches of separation than the 2016 season. That’s a lot of space to miss bats! 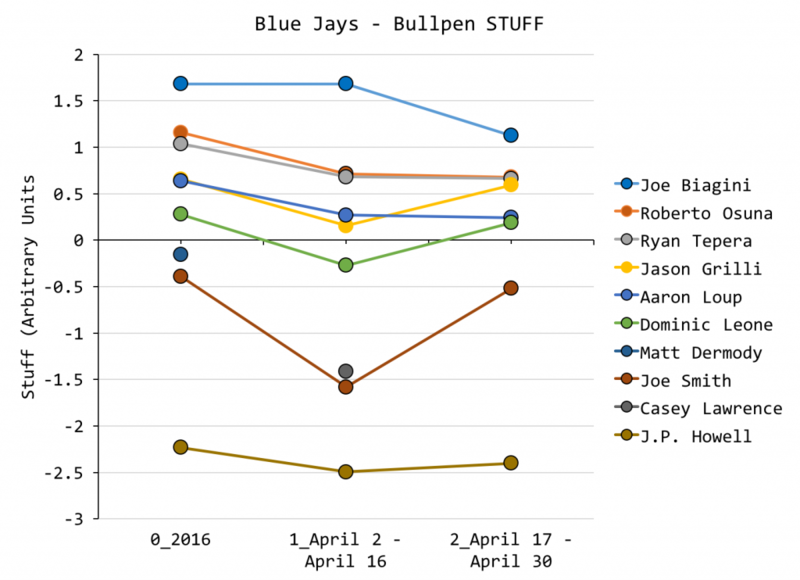 There’s not much positive to to write about in terms of the reliever Stuff, but Roberto Osuna’s steady decline in Stuff is worth noting. While his velocity looks down from the previous seasons, it’s the fact that he isn’t using his fastball that has lead to the largest drop in his Stuff. The movement and the change in speeds looks relatively constant – but let’s hope this is just a matter of Bob getting his confidence back and using the fastball that got him to this level more frequently. 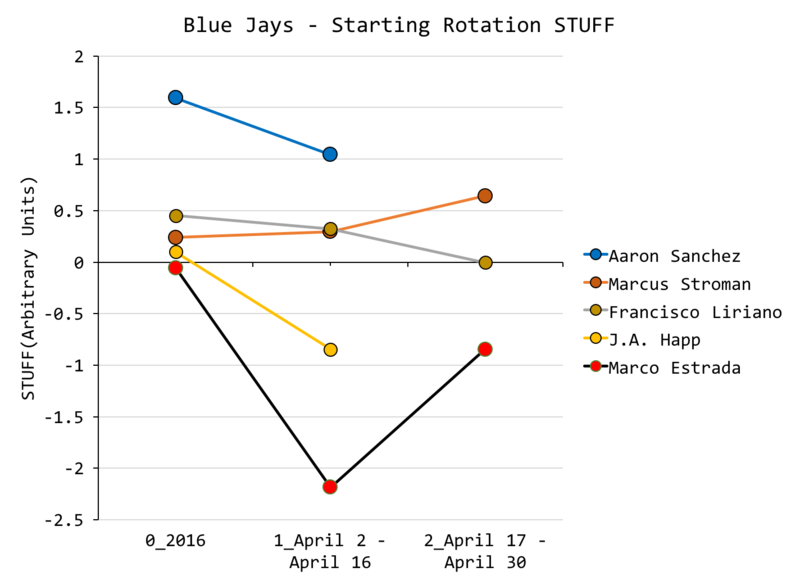 Before the season, I ran a projected Stuff Report to see where we could expect to see the Jays rotation and bullpen rank in terms of their Stuff. This projection pegged the bullpen at 20th overall, and the starting rotation at 16th overall. On a whole, the bullpen looks to be matching their previewed Stuff fairly well – and with Osuna starting to throw his fastball with more frequency, that should be looking even better in the future. They still look pretty good, sitting at 16th in weighted Stuff. As for the rotation, they look a lot worse than their projected numbers. When you replace one of the best Stuff pitchers in the world (Aaron Sanchez), with Mat Latos and Casey Lawrence, that’s bound to happen no matter how much junk the Stro Show throws. 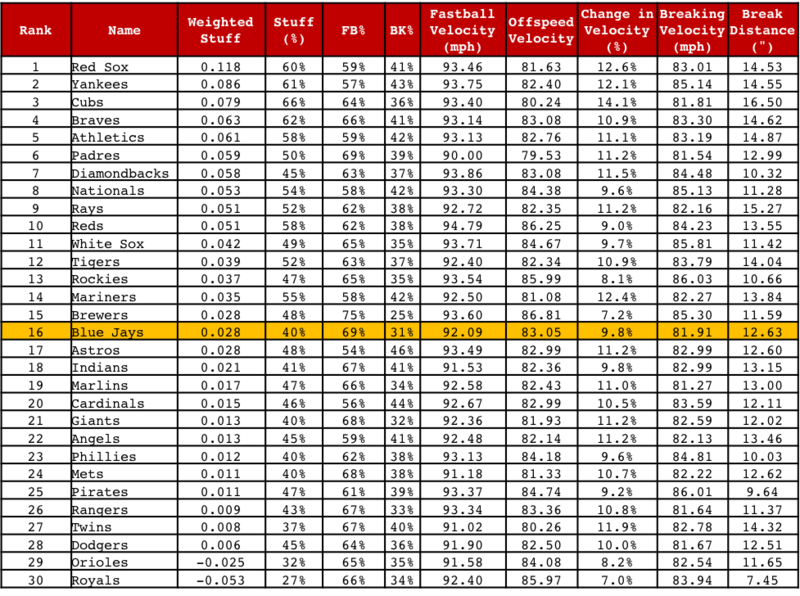 The Jays were projected to have the 16th best Stuff, but they’re near the bottom of the league now at 26th. Just remember – when it was January and -20 and we were all freezing our faces off, we were desperate to watch baseball. This beats the alternative… I think.